There are no photos with those IDs or post 1248 does not have any attached images! Maybe it's his famous caldereta the most emblematic dish, a formula that combines fine rock fish and a wide variety of seafood. It also takes on special gastronomic weight the Cider, with which they cook their most beloved fish: hake, pixin, chopa, king, sea bream ..., without forgetting the grilled sardines, anchovies (anchovies fried), anchovies and small (sardines), members of a wide range from tapas that makes Gijón the quintessential city of winters, llagares and cider houses, omnipresent everywhere. 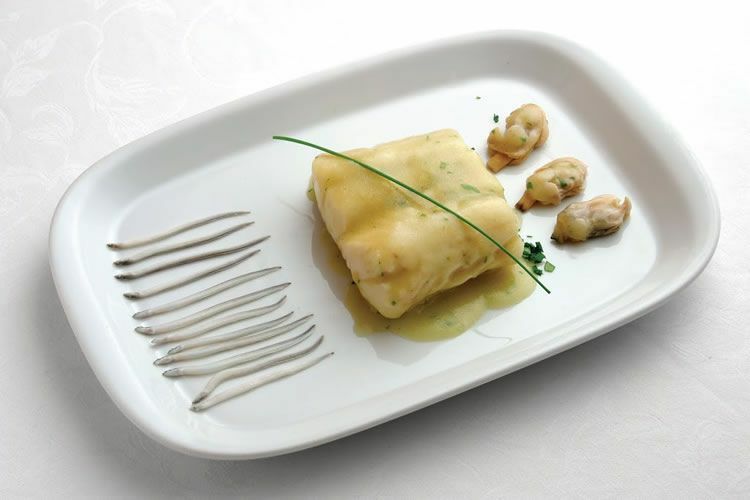 Within the Asturian cuisine, Gijón occupies a leading role, either for its signature cuisine or for its particular maritime seal in the preparation of the most traditional dishes of the Principality. Undoubtedly, the gastronomy of Gijón finds its first source of inspiration, and its raw materials, in the Cantabrian sea that bathes its coasts, being fish and seafood their culinary stars. When sitting at the table your restaurants, with good tablecloth and a professional service for decades, we continue to see in the letters that the fruit of fishing and shellfish is the most repeated: fried of pixy, hake or cod, soups of fish and seafood, pulpu with patatines: a stew in which the pedréu pulp (small rock octopus) reaches a splendid flavor at low heat; squid afogaos ("drowned", because they are cooked with the lid on); and those two exquisite species such as tiñosu (scorpionfish) and golondru (cuckoo or perlon), in a pot; or the indisputable specialty of the ventrisca de bonito, a summer dish that has its origin in the seaside district of Cimadevilla; Typical of summer are also the squid calamari (caught with a hook); and do not forget the monkfish with bugre (lobster), red mullet or grilled and a long etcetera of recipes with a dominant amariscada, enriched almost always with clams and andaricas (nécoras), and without more dressings than the basics: garlic, onion , olive oil, perjil, paprika, white wine and little else. It also abounds the seafood that is eaten without more preparations than a good cooking: prawns, crayfish, barnacles, razor clams, spider crabs, ñoclas (sea oxen), the popular llampares (limpets) and the oricios (sea urchins), one of the greatest gastronomic pleasures that the sea offers and that in Gijón they have been tasting since the beginning of time. In recent decades, the cuisine of Gijón has been enriched by a way of enjoying food in a popular way, a formula that has always been one of the essence of Asturian culture. The espichas join party or celebration, good eating with spikes, hors d'oeuvres in abundance and lots of cider, which in these occasions is usually a barrel or pipe and not bottle. Fritters, sausages, tortillas, sausages and salted meats, boiled eggs, a long etcetera arranged in the long tables of a llagar (the equivalent, it could be said, to a wine cellar), where barrels and large spaces abound. In any case we would not be entirely objective if we identified the llagares and the "simple" food, in many of them there are nowadays all kinds of menus, and in some they even hold wedding banquets. In the vicinity of the Labor University, also near the Botanical Garden, more specifically between the areas known as the Magdalena and the Maizales, there are numerous picnic areas, several cider factories and llagares. In the parishes of Cabueñes, Cefontes or Castiello, where the landscape becomes fully rural, with praos, matos (natural hedges) and quintanas, surrounded by fruit trees, these llagares gijoneses find their greatest density. The forms of gastronomy of Gijón, in addition to the espichas and the aforementioned of Chigres, cider houses and restaurants to use, also contemplate the avant-garde kitchen, for seasoned gourmets looking for new author textures and flavors. A proposal that is developed here in an almost vertiginous way, being already numerous restaurants of this type recognized with michelin stars or with the regional brand of Mesas de Asturias. We talk about new dishes, with new names and no less novel aftertaste: boiled egg cocktail, chorizo ​​brick with cider gel, glass of nécoras ... a culinary reinterpretation, a distinctive touch to please the most demanding palates that come to Gijón because They know it's worth sitting at the table in the capital of the Costa Verde. A response to "La cocina de Gijón"